Disclosure - I have no affiliation with any brand what-so-ever and am doing this review purely out of my quest to find the perfect eye protection for time on the water and provide others with a decent option. 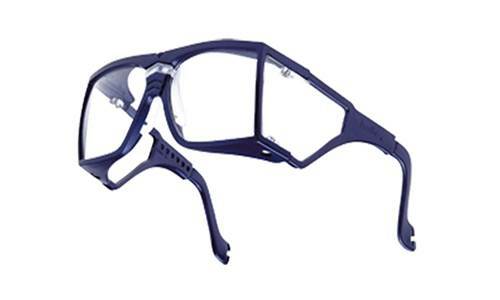 Given the amount of time I spend on the water doing various pursuits, in particular kitesurfing, I have been on the lookout for a decent pair of glasses to wear when on the water for years. I have tried various glasses over the years, from the Bunnings safety glasses with Rainex, to water sport specific glasses and the bottom line is, there is no perfect solution to protecting your eyes apart from staying off the water. Given that is not happening and the thought of continuously exposing my eyes to potential issues such as cataracts, macular degeneration and pterygia I have bitten the bullet and bought another pair of glasses to try. This summer I have not been wearing glasses and have found after a decent session I come home and have sore eyes and adjusting to glare when reading challenging. This disappears after some time. Anyway, I have just bought a new pair of water sunglasses by the brand name of Lip. Let me tell you, that these things are****** expensive however what price do you place on protecting your eyes. It was a bit of a roll of the dice at $300 but hey I thought if it works then the money is not an issue for more time on the water. The glasses are promoted as being water sports specific and that care is needed to protect them and keep them for the purpose that they are intended. Having said that, I only wear them when on the water, wash them after use and keep them in the zip up container they come in. The Typoon glasses I bought are polarised and have numerous "amazing" features...marketing hype maybe. Check their website if you want the specs on these specs. They are secured around your head with and adjustable strap that is then connected to a silicon band that goes around your neck. I have so far used these glasses 5 times in both flat water and surf conditions. They have been slapped hard and have not moved from my head. Obviously they have also copped plenty of spray and dunking in the water and have been pretty decent at not fogging up or frosting over with crusty salt. Even after I have gotten out the water and am packing my gear up, the amount of salt crust on the lens in minimal. These things wrap right around your head to eyes are fully protected and have a large lens which even fits my melon head. I have previously found surf conditions worse for sunnies than that of flat water and generally rip the glasses off after they start giving me the sh!ts and crust over making it difficult to judge oncoming waves. So far with the Lips this has not been a problem and as a result I have happily had full kite sessions without taking them off...miracle! As I mentioned above I don't believe there is a perfect pair of glasses out there for water sports and Lip glasses are not perfect. I have however found these to be the best option I have tried to date and the fact that I will come off the water and would have forgotten that I have sunnies on will vouch for the fact that these are pretty dam good. Do I regret spending $300 on a pair of sunnies...no. I will happily continue to use these glasses as I am now coming home with no eye complaints at all. Would I buy them again if I had to, yes. P.S. On a sideline to this, I also wear a bucket hat to minimise sunburn and this helps in reducing direct above head glare. Having had a carcinoma removed from my face, I am no sunshine hero and find the concept of tanning or allowing myself to get burnt nuts. Look good. Have looked at them before but could never justify the price. 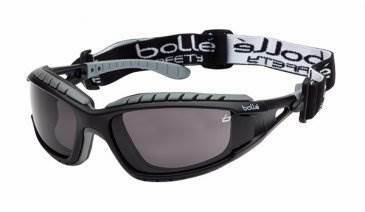 After trying various things from Bunnings like yourself I have found a happy sweet spot myself with the Bolle Cobra safety glasses from SuperCheap. Comfy fit, shed water nicely due to anti-fog coating on the lenses, and at under $30 if they do get scratched or lost it's not a big deal. Also means can buy an extra pair of the darker lenses as well as a pair of the twilight ones for low light days without losing definition or $$$. 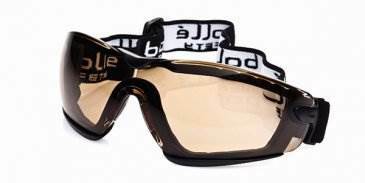 Had tried the Bolle tracker II polarised and had great vision for under $70 but found they tended to fog quicker as water didn't drain as quickly from the bottom of the frames. I've used the bolle trackers. Git them for 8 euros on eBay. Using r?tgem for 3 years. I've just started using Barz Seaway sunnies, on sale and were only $26 deliveredIMO they don't look great on my head but I'm not wearing them to make a statement either. My eyes feel substantially better now for wearing eye protection on the water. Not sure whether it was the glare, UV or salt spray but they would sting afterwards and I would feel extra tired after a session without them. Now if someone can give me a solution to surfing with sun and duck diving in white water when my eyes really cop a hiding I will be indebted to you forever. But today no problems. And how good was today??? When I get onto a wave I pop them up onto my forehead. Not ideal but its the cumulative effect of sun exposure that does the damage. Since we spend most of the time tacking or waiting for a wave it makes a big difference to how your eyes feel at the end of the day. I use Kurtis Sunglasses. Admittedly expensive but it takes awhile before they get covered with drops and they are comfortable and soft so are easy to pop up off your eyes. Have to wear a neck leash because they can come off in wipeouts. They stay on well in duckdives though. One note. Make sure any glasses are super clean before you head out. Anything on them will cause water to stick. Thats why eventually they get covered because of the salt residue probably. Seaspecs - cheap and good. Stay on well too! I did see a guy last weekend at my local wearing a pair of tinted swimming goggles, I am thinking a perfect solution, but I did have to look twice. Just did not look cool. But hey I am sure that they work a treat. Iv'e been using Cancer Council sunnies like this for many years, and they work great! Just attach a flouro colored floating sun-glass leash, and if they come off, are easy to see in the water. Just got the Lip Typoon in blue lenses and have had a couple of sessions. They are good and the clarity is great with the water always beading off. They fit my big head but I do find the nose section a little loose on my face but you just pull the strap a little tighter and that stop them sliding down on your nose. Will have to see how they stand up to wear and tear but they are very good but so they should at $300. 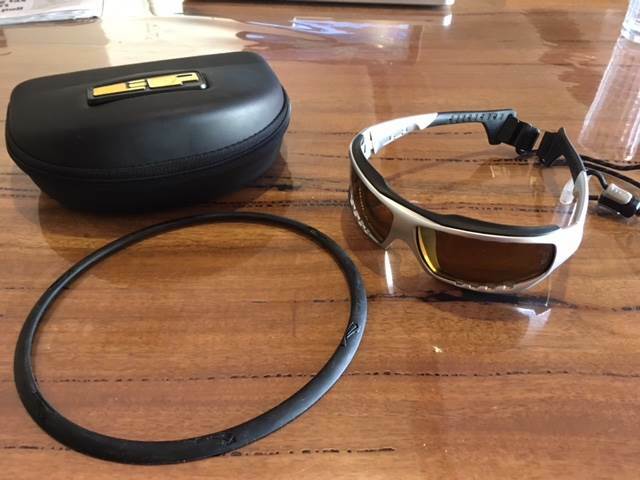 I have used plenty of cheap sunnies and the other cheap water sport glasses and this does seam to be much better than all of them, even the Oakley water jackets that I had for a number of years. I think all water sports sunglasses suffer from the same problems. You have to keep them spotlessly clean to reduce fogging and promote water runoff. You always get a day where the coatings don't quite work, or you've done it wrong, and the salt spots block your vision. They all get scratched eventually. It hurts more when the glasses cost $300. I have tried every kind of wax and coating. They all work to an extent but they're very laborious to maintain. To an extent simply washing with hot water and detergent works almost as well as the coatings. The other problem is that sunscreen washes down off your face into your eyes and onto the lenses. It really stings and the glasses make it harder to rinse your eyes. I have been thinking of making a pair of eskimo style slotted goggles. Just having a simple slot would reduce glare and UV and there would be no lenses to scratch, fog up or get dirty. Anybody tried anything like this? Not disagreeing with any of the above comments regarding sunnies, and as I said in my first review there is no perfect solution apart from not wearing sunnies but ultimately the possibility of getting sun damage is one that I would like to minimise. I have now used the Lips for a number of weeks and can honestly say that these are the best I have tried. I had a 2 hour session yesterday in the surf at Augusta and those down there would tell you it was a solid 25 knot plus breeze with a heap of surf coming in. I was ocean side and used my glasses the whole time. Not once did the glasses crust up with salt, primarily because they were always getting wet and rinsed and I came off the water almost unaware that I had them on. After packing up and putting my gear in the car, I noticed a slight salt haze as they had dried off, but nothing that would force me to take them off. This biggest issue I had with them was during a session I accidentally wiped the back of my hand across the lens and smudged suncream into the lenses. This blurred my vision to such an extent that I had to come in and clean them before going out. I now make a conscious decision to not touch the lenses at all during a session. The vision I get on the water with these things is fantastic, with no reflection issues off the water and I can see all waves and objects very clearly. They do, just as expect them, though, as I mentioned before I only use them on the water and treat them very carefully so as not to scratch them and clean them after each session. When on my head, they don't move a bit and have taken some serious beatings by the water. I use these guys for prescription sunnies: dresden.com.au/ . Good value, all plastic. I found these straps work well: www.ebay.com.au/itm/201632962134 . With a hat on I've never lost them, although I do have to reseat them sometimes after a big wipeout (wear them surfing too (yes I'm a kook)). I don't bother connecting them to my wetsuit or anything. 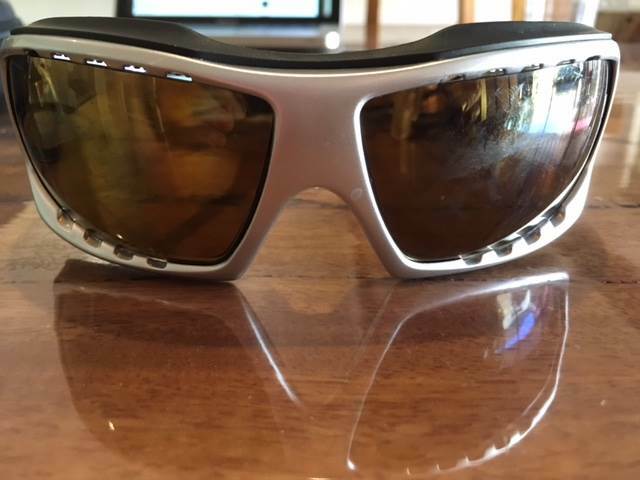 Rudy Project, Do some sailing glass and they have the best wrap around proscription technology I know of but they are not cheap. I just buy some cheap ****ters, slap a $2 neoprene strap thing on them, apply some automotive rain repellent and boom. Job done. I normally kite without sunnies and get sore eyes from the glare. I used Rain X Water Replellent on my sunnies yesterday and it worked OK. Today my eyes feel better than usual. Yeah I agree. Cataracts is on the rise even in young people, and it's most probably due to glare (www.myvmc.com/diseases/cataracts/). I always kite with sunnies. The risks are not worth it. They are very light and float. And they float level so you can see the yellow strip around the top edge. They have fallen off five times now in bad crashes. And I was able to locate them relatively easily. Will have to buy a spare. They are keepers. $55 and no shipping costs for 2 pairs. 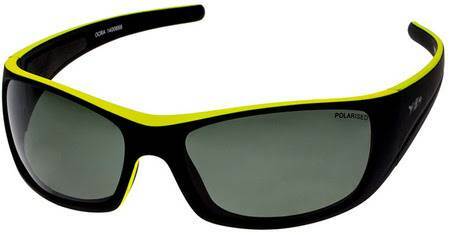 I have used polarised sea specs for years and couldn't kite without sun glasses in the late afternoon sun. I have also used safety sun glasses at times. These are a good light weight option you can drill a small hole in the arms and use a small length of kite line to stop from losing them. Also a good option if you wear a helmet with very small thin arms. So has anyone tried tinted contact lenses? I've multiple pairs of seapeces but have now given up due to popping a lens or losing them all together. I looked at lip sunnies but I'd want to try them on before shelling out that much. Has anyone tried the ion ones with the strap? 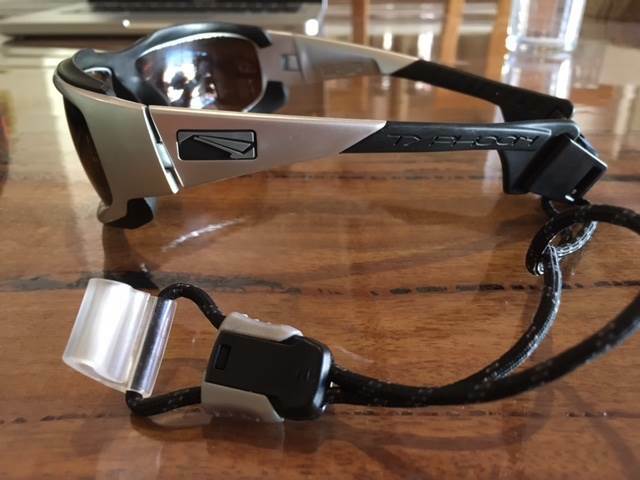 Do kiting sunnies need to have a water coating on them? Or is that just a sales thingy? How do you not loose them in surf? Seabreeze sunnies! Can be fitted with prescription lenses if needed. Comfortable and the retention straps really work.